We are a network of researchers investigating changes in woody vegetation in Arctic and alpine tundra ecosystems. This network was established to foster communication between researchers working in tundra ecosystems around the Arctic and to promote data synthesis. This week is the AGU meeting in San Francisco with lots of exciting shrub-related research presentations. Here are some shrub-relevant sessions and abstracts for you to check out. See you there! AGU – This week is the AGU meeting in San Francisco with lots of exciting shrub-related research presentations! Here are the most shrub-relevant sessions and abstracts for you to check out. British Ecological Society Meeting – This week is also the BES meeting in Edinburgh, Scotland. The “Climate change in the Arctic: linking ecological and biogeochemical responses” symposium provides a chance for high-latitude ecologists to gather together at the meeting. 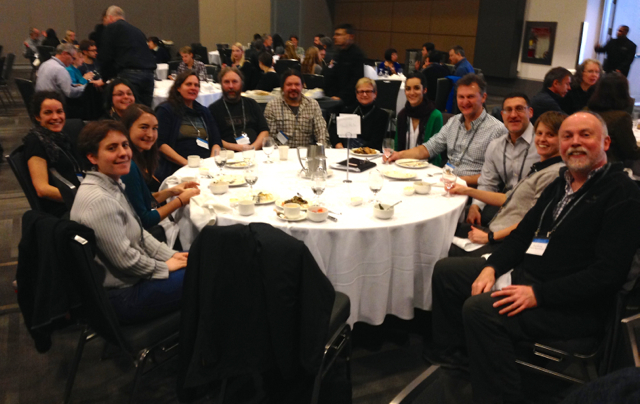 ArcticNet – Last week was the ArcticNet meeting in Vancouver, BC. We held a lunchtime gathering of the shrub-related researchers at the meeting and discussed future research agendas for shrub-related research. We agreed that priority areas include: 1) quantifying the influence of changing soil moisture and precipitation regimes on tundra vegetation change, 2) understanding what is going on with below-ground shrubification in tundra ecosystems, and figuring out what is happening with range expansion at latitudinal range limits of tundra shrub species. Check out the Arctic Tundra and Vegetation sessions for the shrub-related talks and posters of the ShrubHub members in attendance. 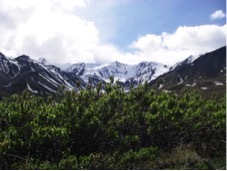 July 2015 – New ShrubHub Pub on climate sensitivity in tundra shrub growth! The latest publication from the ShrubHub Network is published today in Nature Climate Change! This is the culmination of an over five year effort to synthesize the growth of tundra shrubs from sites around the Arctic. We found high but variable temperature sensitivity of shrubs at sites around the tundra biome with higher climate sensitivity at sites with greater soil moisture and for taller shrubs (e.g., alders, willows) growing at their northern or upper elevational range edges. Tundra shrubs in the mountains of the Yukon Territory, Canada. January 2015 – ShrubHub members are mentioned in a recent article in the journal BioScience. Plants Duke It Out in a Warming Arctic by Lesley Evans Ogden. December 2014 – Over the past two weeks ShrubHub meetings were held at the Arctic Biodiversity Congress and Arctic Change meetings. We discussed past accomplishments, ongoing and future activities of the network for 2015. The ShrubHub meeting at Arctic Change in Ottawa on Thursday 11 December. August 2013 – The ShrubHub is mentioned in the journal Science! Tundra in Turmoil – Models and experiments only go so far in assessing the effects of climate change. For a reality check, researchers turn to historical photos. May 2013 – Next week at AmeriDendro Martin Wilmking is giving a talk entitled: “Shrubs – Expanding opportunities for dendrochronologists”. If you are attending the meeting, be sure to check it out! Registration is now open for the ‘Changes in alpine and arctic flora under climate change’ meetings in September in the Swiss Alps. April 2013 – Next week on Tuesday 09 April is the Snow-Shrub-Herbivory session at EGU. There are 12 exciting presentations scheduled covering topics spanning snow trapping and soil temperatures, remotely sensed vegetation change, shrub cover and albedo, and reindeer and lemming herbivory in shrub tundra. See you there! February 2013 – Changing tundra vegetation and increasing shrubs are featured in NOAA’s 2012 Arcitc Report Card and the Canadian Society for Ecology and Evolution Newsletter. October 2012 – New ShrubHub member Christine Urbanowicz has submitted a proposal for the addition of the word shrubification into the Collins Online Dictionary. Add your comments to the proposal webpage to support the proposal! The word shrubification has currently been used in popular science articles, blogs and four papers in the scientific literature. April 2012 – ShrubHub members contribute to an international study published in the journal Nature Climate Change. The study looks at the effect of global warming on tundra vegetation using data from the International Tundra Experiment. Major findings include widespread increases in the abundance and canopy height of shrub species. January 2012 – “Shrub Hub assesses growth in tundra ecosystems” – The shrub hub contribution to the Environmental Research Letters special issue on tundra vegetation change “Shrub expansion in tundra ecosystems: dynamics, impacts and research priorities” has been covered in an article on Environmental Research Web. September 2011 – The IASC sponsored Shrub Synthesis Workshop was held from September 13 – 19 in Davos, Switzerland. During the workshop, 13 participants conducted a data synthesis of growth ring, stem elongation, and other growth data of shrubs from arctic and alpine tundra sites. The workshop was a great success and like many northern scientific adventures had a variety of weather from beautiful sunshine to a foot of snow! For additional information see the Shrub Synthesis Workshop Page. June 2011 – We are making progress on organizing the shrub growth synthesis workshop to be held in Davos, Switzerland from 13 – 19 September 2011. Participants from Europe and North America will meet to conduct a synthesis growth ring, stem elongation, or other growth data of woody shrubs from Arctic and alpine tundra sites. This workshop is supported by the International Arctic Science Committee (IASC). December 2010 – We had a very jolly and productive Shrub Hub gathering at the fall AGU meeting. We discussed synthesis ideas, workshop planning and future uses for the Shrub Hub website. A summary of the discussion will be sent to Shrub Hub members in January. November 2010 – The Shrubring Synthesis Group, part of the Shrub Hub Research Network, was awarded €7,500 in travel support for our shrub growth ring synthesis proposal submitted to the International Arctic Science Committee (IASC). If you are conducting or are interested in shrub research and wish to join this research network contact Isla Myers-Smith. Shrubification or Shrubbification (Arbustification in French): A pattern of increase in cover and abundance of shrub species that has been observed in tundra ecosystems and is thought to correspond with climate warming. Shrubification can occur in other ecosystems including temperate and tropical grasslands promoted by factors such as over-grazing or fire suppression.